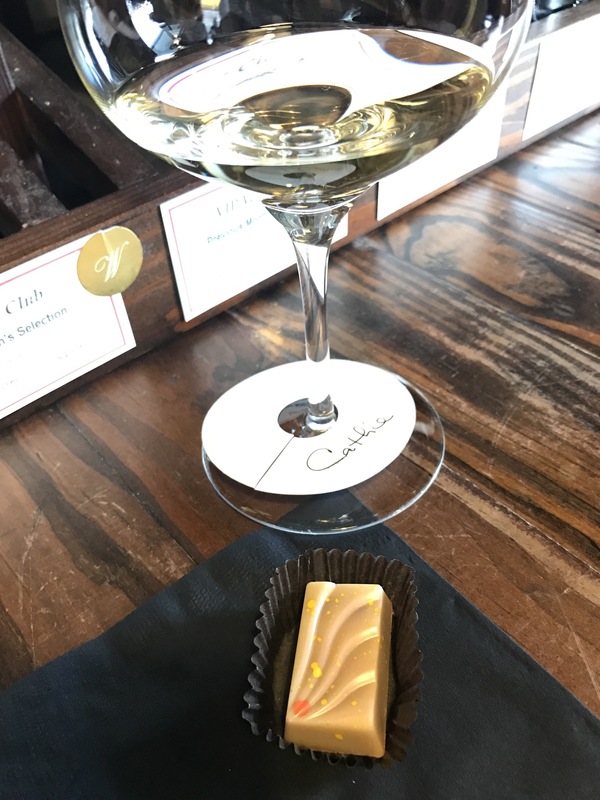 I recently attended an event called Wine Loves Chocolate and wanted to share the yumminess with you. As I’ve mentioned previously, my palette is literally in its infancy but I am working hard at developing my tasting skills. Once, a few years back I had attended an in home tasting and I remember that we tasted a young big bold red, had a piece of dark chocolate truffle and then tasted the wine again. The result was that the wine tasted much smoother and it seemed to be a good pairing to me. 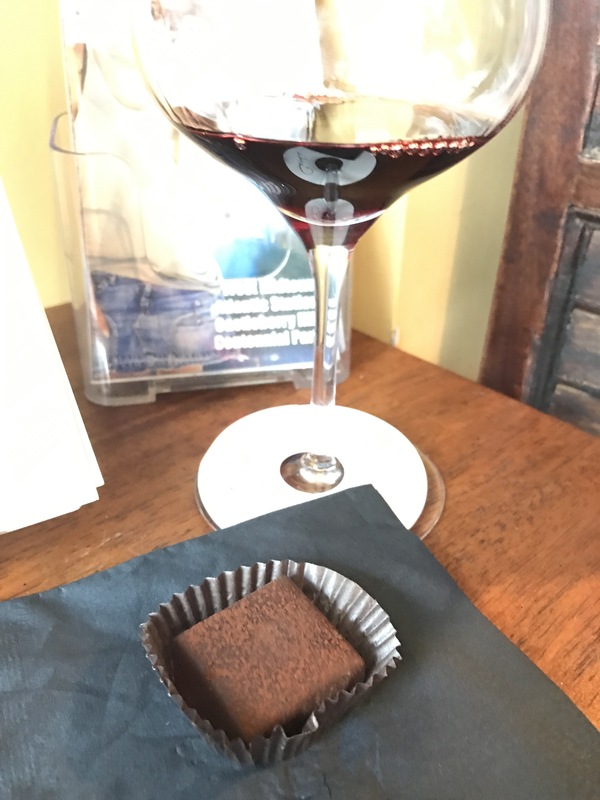 Recently, in my CSW prep course the topic came up and it apparently can be a controversial topic with some people being dead set against the pairing and others having experienced good wine/chocolate pairings. 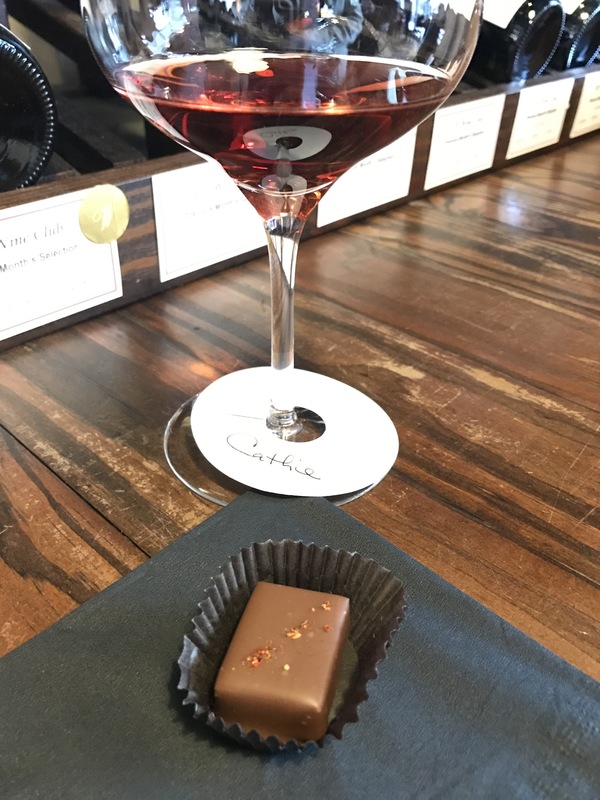 I have to say I thoroughly enjoyed each pairing I experienced at this event, but, as you will soon see, this was no ordinary chocolate and the chocolatier had pre-tasted the wines and created the confections to be paired with each wine. Not the kind of pairing we get to experience everyday to be sure. Il Falchetto Arnies 2014, Langhe, Piedmont, Italy. This dry white wine is 100% Arneis grapes. This grape apparently almost became extinct but is currently enjoying somewhat of a revival. The producer’s tasting notes say that the wine has intense mineral and fruity notes and is fresh, warm and persistent on the palate, strengthened by a fair acid vein. For those of you who enjoy the geek information as much as I do, the vines are grown in sandy soil on the left bank of the Tanaro river. 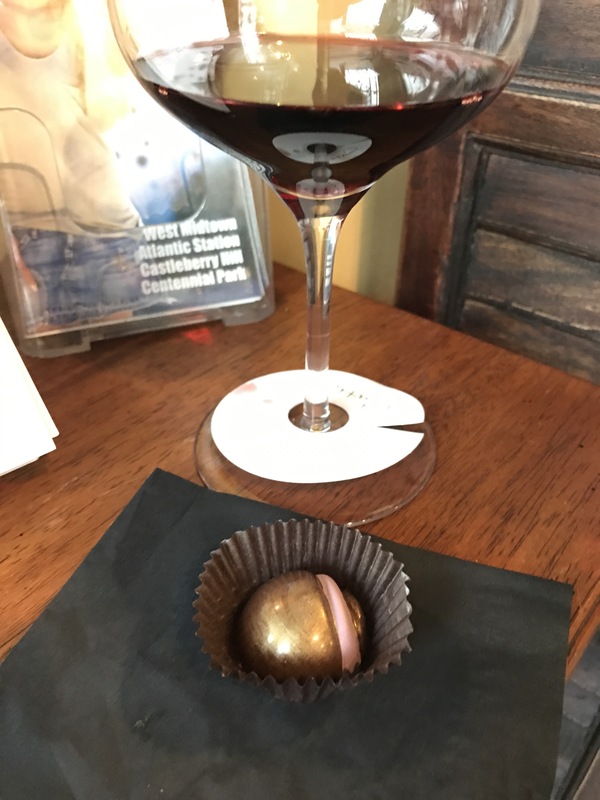 The chocolate for this wine: Mandarin and organic honey milk chocolate ganache, blood orange olive oil, white chocolate shell. This wine is a rose and the color dazzled me from the get go. It was such a deep rose color, just beautiful. The grape variety is 100% Tcocai Rosso and is indigenous to the Berici Hills. The producer’s notes say that the color is ruby red, that it is medium bodied with a pleasantly slight bitter taste in the finish. The vines are grown in iron-rich sandstone outcrops and karsified limestone. Since it is a rose it is interesting to note that the wine was allowed to ferment on the skins for 6-8 days in stainless steel. The chocolate for this wine: raspberry chocolate ganache, infused with flowers and espelette pepper. This wine is classified as a basic red table wine and the name Baric is taken from the vineyard where the grapes are grown, which is in Serralunga D’Alba, also in the Piedmont region. It is a blend with 80% Nebbiolo and 20% Dolcetto grapes. The grapes are soft pressed and fermented for 4-5 days. It is aged for 6 months in Slavonia oak. I couldn’t fine tasting notes from the producer, but I thought this was light bodied and dry. Being a table wine, I like to think this is something I would experience locally if I were traveling in Italy. The chocolate for this wine: tart cherry chocolate ganache with wild mushroom olive oil in dark chocolate. This wine is 100% Tannat. Tannat is not indigenous to Uruguay but is considered the national grape. Uruguay has a reputation for being the best at making great wine from the variety. The Carrau family has been making wine for more than 250 years and appears to be an industry leader in DNA research on the tannat grape. They are also regional leaders in biodynamic and sustainable farming practices. Their website tells me that these vines are 25 years old and are grown in heavy clay soil. It is aged in French oak for 18 months, bottled with minimal handling and aged another 16 months. This wine has cedar and violet on the nose — how can you not love that in a wine that comes from Las Violetas? Plums are evident on the palate with very smooth tannins. The chocolate for this wine: blackberry dark chocolate ganache, plum jam, a hint of violet infused with crushed white peppercorn. This wine celebrates Sterling Vineyards 50 year anniversary. The grape blend is Cabernet Sauvignon, Merlot, Zinfandel and Petit Syrah. Tasting notes indicate raspberry jam, rhubarb cobbler (seriously?) and fresh black cherries with hints of licorice, cocoa powder and mocha. 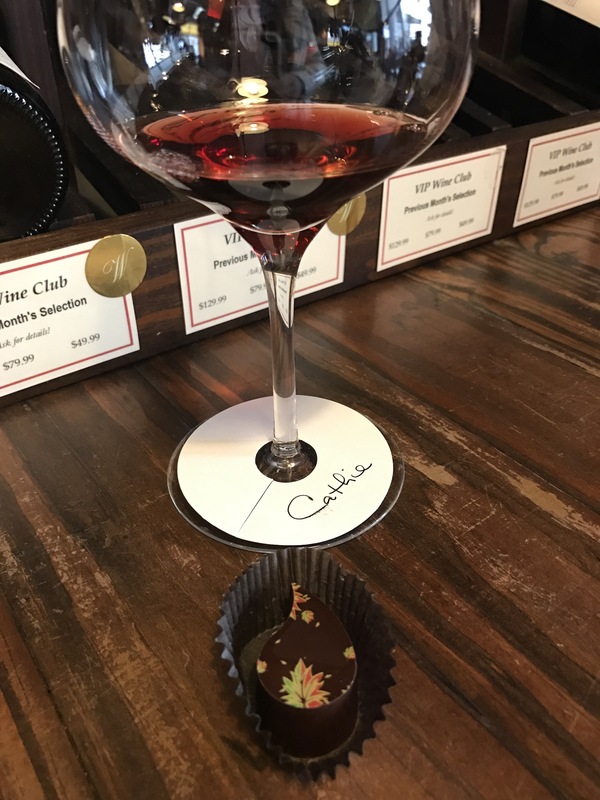 The chocolate for this wine was raspberry pate de fruit, candied licorice infused blueberry ganache with cocoa-coffee dust. This was the first in show for me — I gravitate to the big bold red. This wine was my favorite of the 6 and so was the chocolate. The licorice was so subtle and it worked so well — licorice and chocolate? Trust me on this one. We purchased a few of these chocolates and a bottle of this wine to enjoy at home. Cantine Francesco Montagna Sangue Di Guidua Sparkling Sweet Red Wine, Italy. This was sparkling — so fun! The grape blend includes: 45% Croatina, 45% Barbera, 5% Ughetta and 5% Uva Rara. It is produced in the southwest portion of Lombardy from the Oltrepo Pavese DOC. The producer’s notes tell me that these grapes are carefully analyzed for sugar levels and hand harvested by vine according to their ripeness. It is sweet but also has good acidity for a nice balance. Best paired with fruit tarts, almond desserts and fine pastries. The chocolate for this wine: almond marzipan, blackberry ganache, a reduction of this wine infused into it and stone fruits. All in all, there is not one of these pairings that I would not be glad to have again. 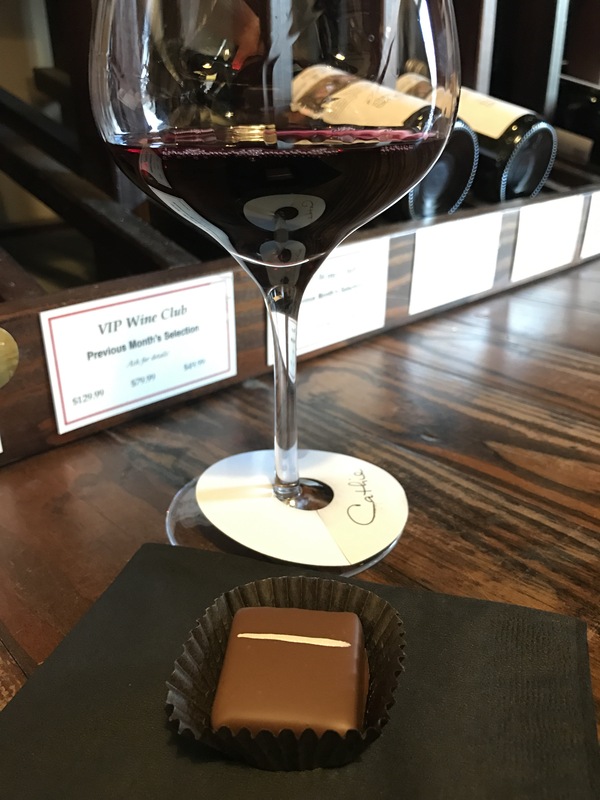 I think when it comes to wine and chocolate pairings I am a fan! Previous Post I Won! I Won!